Then this must be Paris. More exact, this is Notre-Dame. I spent my first day in Paris wandering around Ile De La Cite and along the Seine River. Sarah has gotten me sorted out with Orange phone/internet service, maps, and metro tickets. I am anxious to reacquaint myself with the Paris she and Frederick introduced me to decades ago and with the city I love. Lesley, Rick, and I did a proper last English walk together. We began at a pub, returned from the half-way point pub, and finished at a pub. Our American establishments fail to reproduce the village atmosphere found in English pubs. Sir Titus Salt, a leading industrialist in the Yorkshire, got it right with his 19th century urban planning for his textile factory and employee housing. The photograph shows an example of his neat stone houses for workers. He included wash houses with tap water, bath houses, hospital, school, library, recreation facility, gymnasium, concert hall, billiard room and scientific lavatory. Is there any wonder why UNESCO selected “Saltiare” as a Wold Heritage Site? Today Saltiare has become a fashionable living distract. The textile mill turned into a huge live arts center featuring Yorkshire ‘s David Hockney amazing art, restaurants, shops, and historic displays. It was keen seeing how an old industrial building could be revitalized into attractive and financially profitable space; thus, spearheading residential development of restoring and preserving old neighborhoods. A wee bit of background before moving to Durham Cathedral. I met a father and 16-year old son on my second 192 mile Coast-to-Coast walk and we became fast friends. A few years later James attended Durham University; however, he took off one year to attend Boston College. As that was a year I ran the Boston Marathon, James jumped in the race and ran from the iconic Citgo sign to the finish line as my bandit. Having toured Boston College with James, I was eager to see Durham University with him and his family. Six hundred year old Durham University is the third oldest university in England incorprates Durham Castle and Palace Green, as well as managing a World Heritage Site in conjunction with Durham Cathedral. The photograph was taken at Durham Cathedral Cloister. An amazing day spent with James and his parents, Rick and Lesley. Not surprising bits of Harry Potter were filmed here. Arrived in Yorkshire by train. In less then two hours, I’ve traveled half of England. Lesley, Rick, and James live in a 350 year old home they beautifully restored. The heart of the home is the hearth equipped with an enamel stove for cooking as well as heating the house. Here I sit sipping morning tea. St. Paul asends 365 feet above London offering stellar views of London. The picture was taken from just under the tip-top ball and cross with a climb of 628 steps. Erl who had completed a year’s training to be a London Guide took me to two other fine churches while adding interesting comments like this is the spot where Sir William Wallace (Braveheart) died and this church’s yard rises six feet above the door’s entrance having been layored with bodies from the plague. My second grand view of the day was from the 43th floor of One Canada in Canary Warf the “new” skyscraper financial area in London. This was the office of Chris, a special friend met during my first Coast to Coast walk. Chris was taking his father on the C2C walk as his father had begun it decades earlier and had to stop the almost completed 192 mile walk because of family illness. These dear men befriended and led me half-way across their nation. Lunch with Chris easily closed the gap of ten years. His father in his 80’s still walks and is embrassing the technology of a new SmartPhone while Chris has married and is the proud father of two darling girls. As the saying goes it’s the people who make traveling special. Joanna and I celebrated my last night in London with dinner at a neighborhood French restaurant. Though London comes to a close we delight in our plans for the Camino as she will join me for a week walking in France and another week in Spain. Who would have thought two women walking Scotland’s West Highland’s Way would develop keen friendships, share their homes and other long distance walks. Made a day of exploring the Tower of London. The Crown Jewels were phenomenally spectacular. Nature’s beauty crafted by man turned the Cullinan Diamond weighing over 3,000 carats into the First Star of Africa set on top of the Sovereign’s Sceptre (estimated to be worth $400 million) and the Second Star of Africa set in the Imperial State Crown. Queen Elizabeth The Queen Mother 1937 coronation crown featured the legendary Koh-i-Nur (‘Mountain of Light’) 106 carats diamond. Would not Lord of the Rings’ Gollum be uttering, “my precious” had he been where I stood? 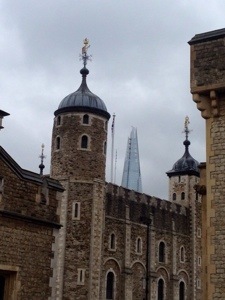 The photo shows the Shard, an 87-story skyscraper, in the background and the Tower of London in the foreground. Will our generation’s architecture genus hold up to the test of time as well as the 930 years old Tower of London has?